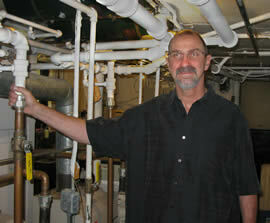 Jeffrey has provided his customers with expert plumbing work for over 25 years. He takes great pride in his work and maintains high standards for his employees. He is dedicated to customer service and has developed long lasting relationships with his clients who return to us to year after year. Jeffrey Kratowicz, President of Jeffrey’s Plumbing and Heating Service, knew he wanted to be a plumber by the age of 6 so he could follow in the footsteps of his hero, and father, Alex Kratowicz. He worked side by side with his father for the first 8 years of his career, taking care to learn everything this experienced and expert plumber knew. Then in 1982, with a desire for independence and armed with his father’s expansive knowledge, he ventured off on his own and started his own business. Now 25 years later Jeffrey still works with some of his father’s clients and has built a following of his own. Jeffrey enjoys and takes pride in his work and serving his customers. Jeffrey understands his clients’ needs as well as the stress and disruption plumbing repairs can cause. He takes the time to help his clients’ understand the work that needs to be done and he does his best to assure their satisfaction.